It’s rare to see an acclaimed musical that is close to your heart and nearly a decade old presented in a way that makes you feel as if you are seeing it for the first time. It is even more rare to have this happen two years in a row. 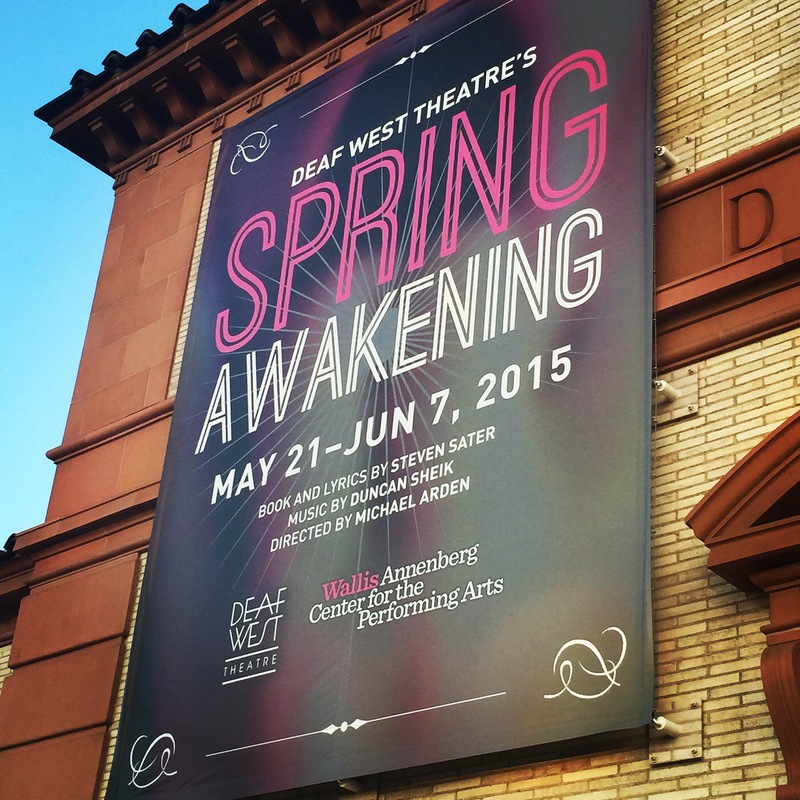 I first saw Deaf West’s Spring Awakening last fall at the 99-seat Rosenthal Theater and it was my favorite thing I saw in 2014. The stunning production, brilliantly directed by Michael Arden, is now back on a larger scale at the Wallis Annenberg Center for the Performing Arts in Beverly Hills, where it officially opens tonight. After bawling my way through the second act at their final preview last night, I doubt it will be topped for me in 2015, either. I suspected this last year but am now certain that this version, presented simultaneously in traditional English and in American Sign Language by a cast comprised of both deaf and hearing actors, is the most effective, meaningful, moving version of the show to exist to date. This actually makes perfect sense—Spring Awakening is about the struggle to communicate, particularly between adolescents and adults, and the devastating effects that can have. The language barrier present in this production amplifies those struggles tenfold, leading to the deepest understanding of these characters yet. Back in October I wrote in detail about the many reasons I loved this production, all of which I stand by. The cast this time around is primarily the same, with two notable additions from the theater community. Andy Mientus (Smash, Broadway’s current revival of Les Miserables) is reprising the role of Hanschen that he previously played on the first national tour, and original Broadway cast member Krysta Rodriguez (Smash, Chasing Life) is playing Ilse, a role she understudied nearly a decade ago. The staging has also been altered a bit to suit the larger venue, which has luxuries the tiny Rosenthal did not—for example, a portion of the front of the stage that lowers and rises as needed, which is particularly effective during a funeral scene. About half of the characters are portrayed by deaf or hard-of-hearing actors who are paired with a hearing actor who portrays their “voice,” singing the songs, speaking their lines, and also playing instruments as part of the band. Every actor in the production also uses American Sign Language. Of the many stunning directorial choices made by Mr. Arden that make this production so special, I was again fascinated by the powerful choices made to occasionally have important moments played out either only in ASL or only in English. For example, when Melchior (the perfectly youthful Austin McKenzie, who will surely be a star one day) reaches key moments in his seduction of Wendla (Sandra Mae Frank and Katie Boeck as her voice), he stops speaking and uses only ASL, which she uses exclusively, to better connect with her. On the flip side, Ilse’s final, devastating words to Moritz (Daniel N. Durant and Alex Boniello as his voice) are only spoken and not signed so that he never “hears” her last plea. These seemingly small choices were unbelievably effective. Another aspect I focused on this time was the use of the “voice” actors not only as a mirror for their deaf counterparts onstage, but as a way to illuminate the character’s inner thoughts. While Wendla outwardly keeps it cool during her first solo encounter with Melchior in the woods, inside she is a giddy young girl intrigued by a boy for the first time. When Ernst (Joshua Castille and Daniel David Stewart as his voice) is kissed by Hanschen for the first time, Stewart spun around with joy. What may have begun as a necessity to communicate the show in both languages has become an interesting way to get a more thorough look at the characters’ emotions. I found myself caught off-guard by how much the performance I attended affected me on an emotional level. I first got full-body chills during “Touch Me,” which has always been my favorite song in the show but is just staged in such an unbelievably beautiful way here (and sung brilliantly by the absurdly talented cast). It is important to note that ASL is a beautiful language that folds right into the choreography, making the entire production a gorgeous expression of movement. I must single out Ms. Rodriguez, who recently completed chemotherapy for breast cancer, a journey she has been chronicling at her blog, Krysta Couture. I did not expect her current personal struggle to become a part of the story in a powerful and brave way, but it did. I am not going to spoil the specifics because I encourage all who are able to see this brilliant production for themselves, but it was the first moment of the show that reduced me to a blubbering mess. The second was the finale, “Song of Purple Summer,” when I just found myself overcome by everything Mr. Arden and the cast and creative team had said so beautifully. This production runs through June 7th, and I truly hope it is not the last we see of it. I believe (pun intended) this is the optimal way for this story to be told, and I want all fans of Spring Awakening in its original form as well as new fans to be able to know the wonder.